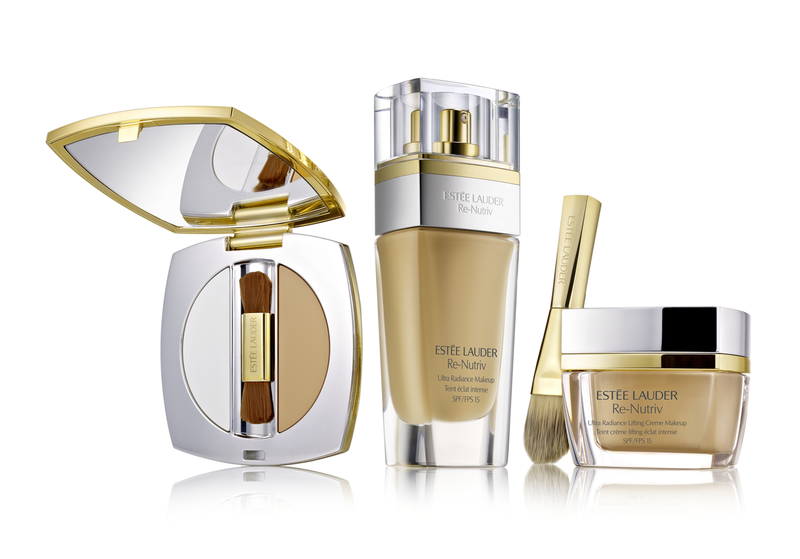 Estée Lauder Re-Nutriv presents Ultra Radiance Makeup: the world's most luxurious Foundation collection with formulas that combine rare and precious ingredients with proven Foundation know-how and the extraordinary Re-Nutriv luxury. The unusual trio of Re-Nutriv Ultra Radiance Creme Makeup, Ultra Radiance Liquid Makeup and Ultra Radiance Concealer & Base Smoothing makes the skin glow and youthful while minimizing lines. Estée Lauder Re Nutriv-neobyčajný Radiance Make-up: Je na svete naluxusnejší makeup, ktorý obsahuje vzácne a cenné zložky, ako jemne mleté drahé kamee - zafíry, rubíny a nefrit. Nezvyčajné trio Re-Nutriv Ultra Radiance Creme Makeup, Ultra Radiance Liquid Makeup a Ultra Radiance Concealer & Base Smoothing vyhladzuje a rozžaruje pleť, dáva jej mladistvý vzhľad a zároveň minimalizuje vrásky. The new Re-Nutriv Ultra Radiance Creme Makeup immediately provides the skin with intense moisture. The Re-Nutriv Ultra Radiance Creme Makeup protects the skin with a broadband sunscreen from harmful UV rays and environmental influences (SPF15). Nový Re-Nutriv Ultra Radiance Lifting Creme Makeup okamžite poskytuje pokožke intenzívnu vlhkosť. Re-Nutriv Creme Ultra Rozjasňujúci make-up chráni pleť pred škodlivými UV lúčmi (SPF 15) a pred vplyvom životného prostredia. Each precious drop of the new Re-Nutriv Ultra Radiance Liquid Makeup pampers the skin. The light, hydrating formula glides on effortlessly and quickly blur and provides a flawless coverage that lasts all day. Re-Nutriv Ultra Radiance Liquid make-up rozmaznáva pokožku. Je ľahký a hydratačný, kĺže bez námahy po pokožke a rýchlo sa rozmazáva a zaisťuje bezchybný pokrytie, ktoré vydrží po celý deň. The new Re-Nutriv Ultra Radiance Concealer & Smoothing Base includes two revolutionary complementary formulas which perfect covers skin disorders and ensures a flawless finish. Nový Re-Nutriv Ultra Radiance Concealer/Smoothing Base perfektne pokrýva kožné ochorenia a zaisťuje bezchybný povrch. Sounds good. I would love to try them! The stuff is awesome. Nicely reviewed!